Our routine for reading at bedtime is that my children and I each pick a book to be read aloud. We choose among the books from our weekly trips to the library. This week we picked up a large stack of books and over half of them were written by Eve Bunting. From the stack this week, the book that emerged as my children's favorite was I am the Mummy, Heb-Nefert. In this book, Heb-Nefert, tells a story of when she was young and beautiful and how things changed throughout her life. Her time spent as wife to the pharaoh's brother, Ti, was grand and luxurious but when she recalls her childhood, things were much different. Eve Bunting continued Heb-Nefert's story by capturing the emotions of the mummification process and after-life until it is revealed that this particular mummy is a part of a museum exhibit. As I was reading the book for the second time I remembered an experience I had when I was in fourth grade. 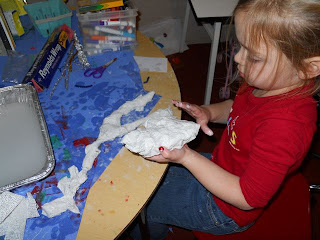 We studied Egyptian culture through art and one of the most memorable projects was making a mummy. My memory is usually very poor but I remembered everything about the process. 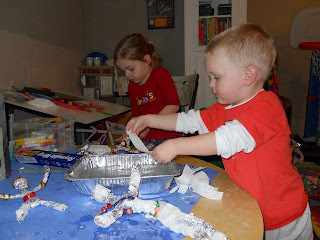 I knew that my kids would love this project, so off to the craft store we went! 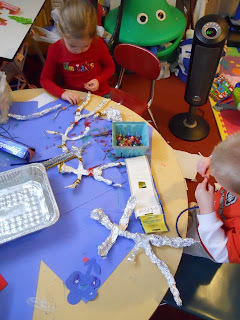 The only thing we needed to purchase was plaster cloth wrap, as we already had aluminum foil, beads, and gold pipe cleaners. We got a 8"x 180" roll for $8.99 which was plenty for this project. We started by making our people out of aluminum foil. We did need tape to hold legs, arms, and heads together. 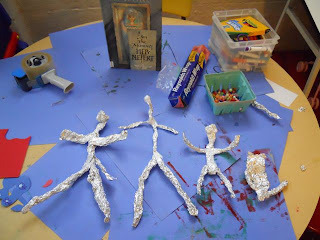 We named our people the characters in the book, Ti (the pharoah's brother), Heb-Nefert (his wife, the main character in the story), and another guy my son called "The Dad" (not in the story). My daughter also made the cat, Nebut, who was the companion of Heb-Nefert. Next, we added beads and gold pipe cleaners to "bejewel" our characters. 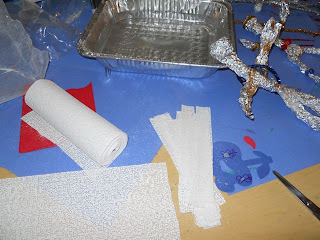 While my children added the jewelry, I cut the plaster cloth wrap in strips and readied the tin with water. 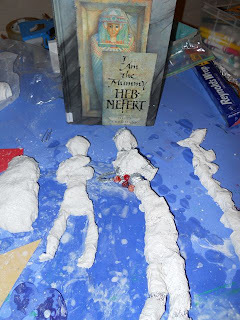 Ti, Heb-Nefert, Nebut, and "The Dad" were sufficiently decorated and awaited mummification. Nebut was well preserved by my daughter. 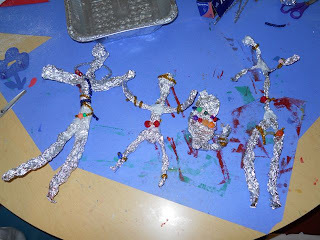 Our finished mummies were wrapped with "arms folded on their hollow chest". This is my third time featuring Eve Bunting on the blog. Most recently, we had a Halloween celebration, highlighting many of Bunting's books perfect for reading before Trick or Treat festivities. Last year, I celebrated her birthday by recalling books I had read while I was teaching like Fly Away Home and The Wall. In that celebration I also mentioned many of her holiday books including my favorite December, which gave me the chills once again this year when I read it to my children. I can't help thinking that each post about Eve Bunting has been different. Eve Bunting's career began after taking a writing course at a community college. She enrolled in this course after her children were all in school and she "was not desperately needed as much." (Just One More Book). Even though she started writing later in her life she has published over 200 books which many are, but not limited to, picture books. Many of these picture books cover more complicated topics such as emigration, war, homelessness, and death which lends them to being favorites of teachers and college professors. Yet, she manages to simplify and focus her message for younger minds to understand. Bunting was born as a Protestant in Northern Ireland and was affected by the emotions she recalled growing up where she was "taught prejudice" toward Catholics (Just One More Book). Later as an adult, she became aware that both Catholic and Protestant children did not understand why they had these feelings only knowing "they just didn't like them." It was this realization that defines many of Bunting's books as she wants to present situations of "injustices and unfairness" to children so they are encouraged to "think and consider." She is a teacher through her books. 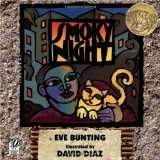 Her book Smoky Night, about the Los Angeles riots, was awarded the Caldecott Medal in 1995, is an example of one of Bunting's books that teaches a complicated topic by simplifying the message, capturing the emotion of the event and relating it to children. There is a book written by Eve Bunting for every adult and child, young and old to enjoy. Her books are told through the eyes of a child. Many will give you chills, make you cry, and give you hope. Try taking home a stack from your library and see which book emerges from the pile as a favorite - I'd love to hear about it! What a great post. When I was a kid I loved reading about the pyramids and the culture in Egypt. What a fun craft too. Thanks for linking up on Read a Book! I appreciate it. It's been nice this week I've had a few new blogs link up and I've gotten to see a variety of books. Be sure to link up again next Saturday - if you think about it on Christmas Day. Maybe I'll put the linky up early Friday. Looks like they had ALOT of fun!!!! I love this! Love your blog layout! Thank you for stopping by my blog hop. Happy Holidays! Thanks for linking me to this post, Eric. What a great project! My girls and I actually mummified an apple back a few months ago. Thank you so much for introducing me to Eve Bunting. I love what she is trying to achieve through her picture books.